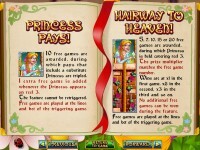 Hairway to Heaven is a new online video slot game powered by Realtime Gaming software. This particular game can be found in the ‘Real Series Video Slot’ menu and is accessible in the download client of any online casino powered by the software. This slot has 50 paylines, an expanding wild, three different bonus features guaranteed to trigger within 125 spins, and progressive jackpots. 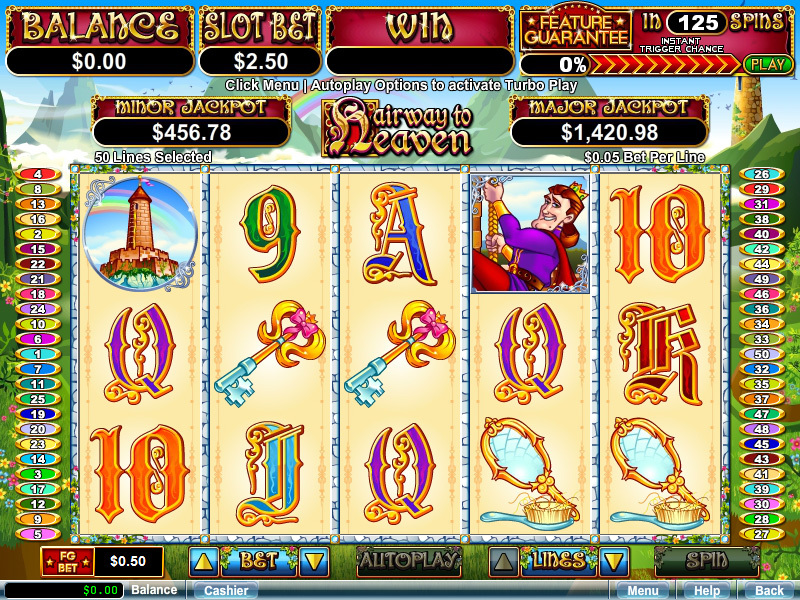 A new addition to the slot menu, Hairway to Heaven is similar in many ways to other games but with few added perks that make it just a bit different than others on the same software. Don’t get me wrong there are quite a few different aspects that make this new game worth playing. First thing first, the theme. The theme is fairy-tale meets fantasy and fun. 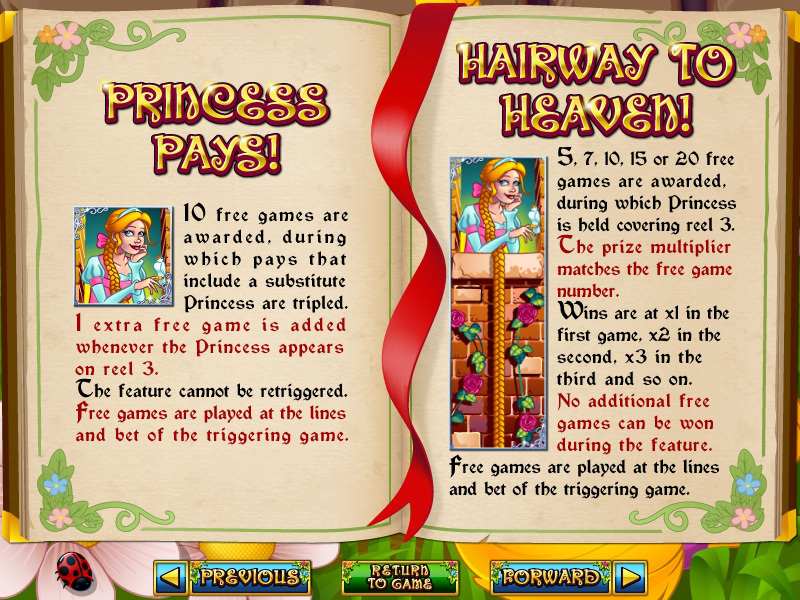 Hairway to Heaven is a take on the Rapunzel tale and the main characters are the Princess and the Prince who pay big pay-outs in the right combination, up to a huge 5000x your total bet. The Princess is the wild symbol and she expands on the third reel. There are also major and minor progressive jackpots, just as you would find in other games from the software and these jackpots can be triggered with any bet at anytime. The minor jackpot is lower than the major but both jackpots are worth the spin and the pay-table wins are also attractive and well worth trying out a few spins, even for the jackpot potential alone. There are a few bonus features worth mentioning too. 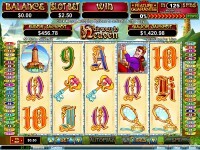 The free games which are activated by three scatters on the reels and up to 20 free games can be achieved. 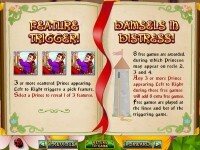 There are different games depending on which Prince you pick when the features are activated. 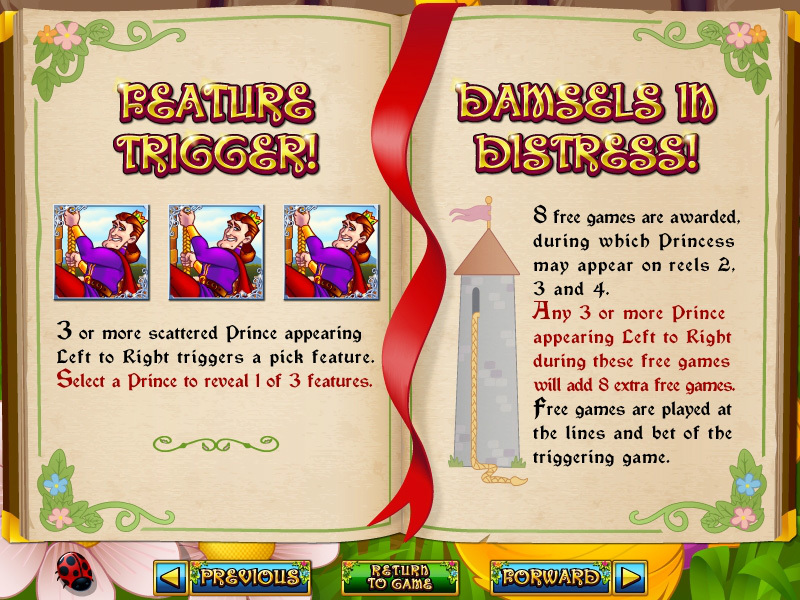 The Princess Pays feature offers 10 free spins with a triple multiplier and the Damsel in Distress feature is 8 free games with a possibility of re-trigger just by landing another Prince during a free spin. The Hairway to Heaven feature lands you 20 free spins with a growing multiplier and can bring you the huge 5000x with the right reel combo. Wilds, scatters and other common slot game symbols appear on the reels so it doesn’t stray too far from the typical slot game at RTG, however with more pay-lines, more pay outs are possible. This game is a fresh and fun way to pass the time at your favorite RTG powered casino and it seems like it could easily become a player favorite game as the pay-out potential is pretty huge. The theme is fun, the betting options are flexible and the jackpots are climbing by the second. If you like RTG and you love to try new games, find Hairway to Heaven at any of the recommended online casinos on this website.